Are you looking to improve the safety and security of your home? Want the peace-of-mind that comes with knowing you can see what’s happening at your house — even if you’re thousands of miles away? Need to enhance your existing security system with high-quality surveillance cameras? Home surveillance systems are quickly becoming a must-have among homeowners who want to deter property crime, monitor activity around their house, and even keep an eye on their family pets. Here at Access Key Service, we design, install and maintain surveillance systems in Newtown Square, PA, as well as the surrounding areas including Wayne, PA, Brookhaven, PA, and throughout Delaware County, PA.
Security cameras have been used at banks, hospitals, shopping malls, and businesses for decades simply because they are a highly effective tool that helps to reduce property crime. With the development of new smart home technologies, home surveillance systems are now becoming a standard fixture in Newtown Square, PA, where homeowners are installing cameras that let them keep an eye on their front doors, backyards, garages, and even the interior of their homes. Do you want cameras on only the exterior, or would you like interior coverage as well? What areas of your home do you want your surveillance cameras to cover? Will you be installing cameras in spots where they will be exposed to rain, snow, and high winds? 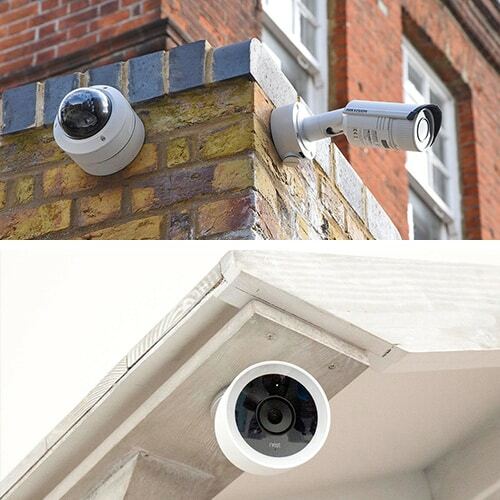 Do you want your cameras to be easy to spot, or are you looking to conceal your surveillance cameras? Would you like your cameras to activate only when motion is detected, or do you want continual recording? Do you need cameras that allow for two-way voice communication via your smartphone or a control panel? Would you like to have images recorded to an in-home DVR unit, or do you want to use a cloud-based video recording service? Why Hire A Home Surveillance System Expert? While it might be tempting to try and install your own home surveillance system, the fact is that installing security cameras is more complicated than you might think. Hiring a licensed, registered, and insured locksmith who specializes in surveillance systems means you won’t have to worry about whether or not your cameras are located in the right spots, your system is secure against hackers, or if critical video clips are being recorded correctly. As the only mobile locksmith serving Newtown Square, PA and communities throughout Delaware County, PA, we are your local home surveillance system experts. We take pride in providing you with expert advice and quality products at fair, honest prices, and we guarantee all of our products and services. Call us today to learn about the latest in surveillance systems for your home.